Legian Kuta – Bali, 14 October 2013 - Last Friday, 11 October 2013 was marked the grand opening celebration of what has quickly become one of Kuta’s most popular hotels, the Harper Kuta. Having soft opened in July, the hotel has immediately enjoyed unusually high occupancy levels of 80% and above and immediately received loads of accolades on Tripadvisor and several other customer review websites. The Grand Opening Celebration marked an open invitation for several hundred travel agents, tour operators, media representatives and holiday makers residing in the central Kuta area to experience The Harper Kuta’s unique rustic yet ultra modern design concept and its signature restaurant “Rustik Bistro & Bar", with great entertainment by the hotel's resident DJ, door prizes and hotel front and back of house tours. The new Harper Kuta is being described as "modern – rustic," and images posted to the brand's Web site, www.HarperHotels.com, in some ways reflect the aesthetics of a cozy countryside home while remaining unmistakably Asian and modern in its core. The handsome hotel sits right of Jalan Legian in the very heart of Bali’s legendary surfer enclave of Kuta and offers 149 rooms and suites, many of which offer private balconies, a stunning outdoor pool with sun deck , a children’s pool, and an intimate spa, and the Harper brand's signature restaurant "Rustik Bistro & Bar". 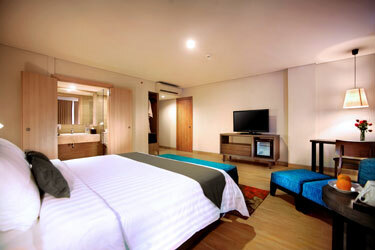 Conceptualized to be modern yet infused with rustic charm the hotel conveys a residential feel. Combining comfort and functionality, Harper’s design concept uses warm, rich colors to offer comfort in each room. Accents of warm autumnal fabrics and soft orange hues promote relaxation - spiced pumpkin, tangerine and amber are popular variations of the orange palette - while modern grays create an understated cool elegance. The principal restaurant “Rustik Bistro & Bar” offers home comfort food cooking paired with great wine and cocktails in a fresh, light and elegant room placing an emphasis on creating dishes that promote the finest home cooking – both European and Indonesian such as Coq au Vin, Beef Stew – Beef Rendang and Soto Ayam. “The new Harper Hotel concept opens the doors onto a new world of well-being and sensations. We all like to have a place to call our own and while travelling; this means comfort, practicality and a true reflection of our personality, a hotel with inspirational and distinctive interiors, finished to the highest quality standards,” said Archipelago International’s Vice President of Sales & Marketing, Mr. Norbert Vas. 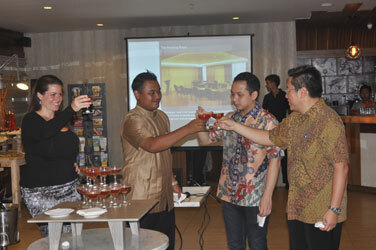 Snapshoot of the Grand Opening Celebration Harper Kuta champagne toast. Seen in the image (from left to right): Ms. Tenaiya Brookfield as Director of E-Commerce Archipelago International, Mr. Budhiwijaya as General Manager of Harper Kuta, Mr. Robin Makmur and Mr. Handy Lim as Directors of PT. Graha Bali Propertindo. Harper is the brainchild of Archipelago International, an Indonesia based hotel operator with Hawaiian roots and an underlying portfolio of more than 150 Hotels and Resorts. Modern, yet infused with rustic charm, Harper Hotels convey a residential feel and a balanced functionality, offering unobtrusive service and never ending innovation - hotels for astute travelers who value individualism and character.